It’s been a busy few weeks and I imagine my work-load will continue for the next couple weeks, so it’s always nice to have an ace in your pocket to help ease you through the crazy times. This meal is a total winner on all fronts and I’ve eaten this dish a lot lately – and I’m not complaining. One, it’s a cinch to whip up, even on the craziest days, and two, it’s a mouthful of flavour – the salty feta mingling with the lemony-goodness and a punch of red onion crunch. It all makes for a tasty bite. I had been making it without the almonds and it’s delicious as is. But the almonds! Oh, the almonds! Toss a handful or two in a skillet and pop them in the oven at 300F degrees and keep a close watch cuz these things tend to turn from roasty perfection into burnt nutz quickly. 10 minutes should do it – but taste one to make sure. Just throw a handful into your bowl and enjoy. Now, wasn’t that easy? elsewhere: Craving some good old-fashioned oatmeal cookies? Over at Poppytalk, I share a doozy of a recipe. And at ReadyMade I make my first brisket and it’s good, really, really good. Cook orzo in salted water until just it’s just about done. Add the spinach to the pot and stir it around so that it wilts. Cook for a minute or so and drain into a large bowl. Toss with lemon juice, zest, olive oil, garlic, onion and feta cheese. Sprinkle with freshly roasted almonds. Give everything a good grind of black pepper. You probably won’t need salt because of the feta, but adjust seasonings to your taste. I’ve actually been cooking a lot of Orzo lately too! One of my fave go-to pasta’s…I love this combo, you just can’t go wrong. 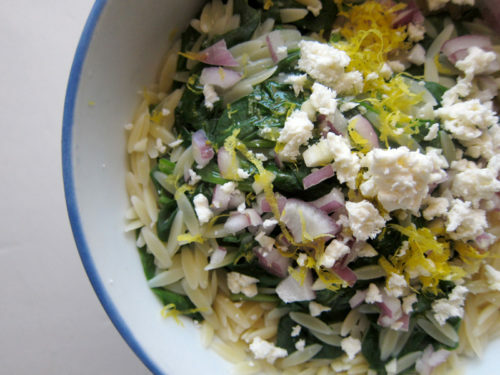 I love a good pasta dish full of lemon and greens! And almonds are always a good addition, yum! 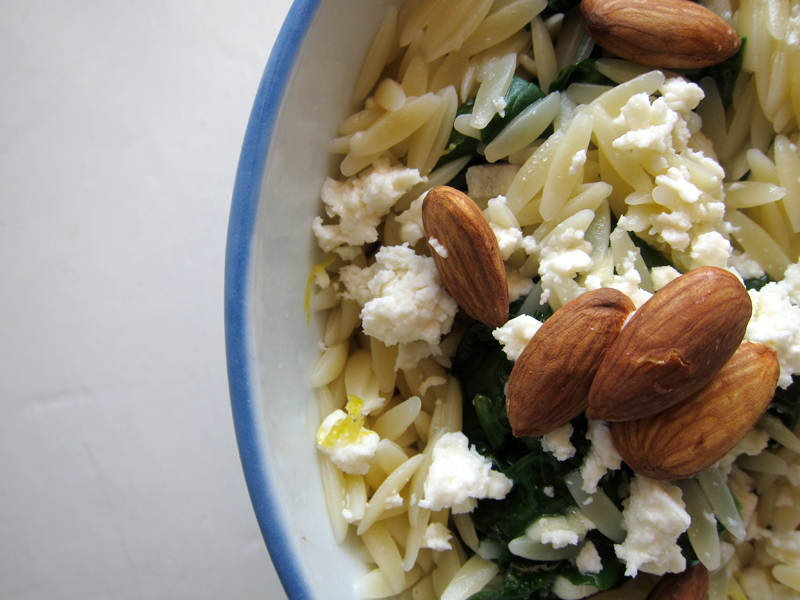 I love speedy little one pot dishes like this…looks delicious with the feta and lemon and the nuts! Looks great! I have a similar orzo salad that I make, but I haven’t tried it with almonds. That extra crunch sounds like a nice addition. It’s amazing how far a handful of nuts can go in terms of flavor and texture! I think this dish is so wonderfully balanced! The lemon in this dish makes me yearn for bright fresh food of Spring and Summer – this is going on the menu! I feel compelled to make this because it contains all my favourite ingredients. 🙂 It’s probably a great way to spruce up a rather boring work day. Greens + lemon + creamy cheese + crunchy nut = my default pasta/grain salad. Seriously, I can’t make one without them. Yum. This ingredient combination, or something similar (like orange, shallots and goat cheese), finds its way into our cooking frequently. So fresh and vibrant. A nice way to herald in spring! MMM. I make a similar one but add in toasted pine nuts, black olives, peppers and cilantro. My favourite thing to eat! Orzo pasta is one of my favourite shapes of pasta. This looks really easy to make, affordable and tasty. I love one bowl meals! Thanks Eva, it’s a good one & quick to boot! Jacqui, I think I add almonds to everything. RCG, I don’t think of this as a salad because it seems much more like a traditional pasta dish, but it’s such a good one and I’m sure it can easily be eaten cold the next day as leftovers. Alicen, you could add broccoli or another kind of veg that works for your family. Michelle, one bit and you can easily fool yourself that summer is around the corner! Yes! Vicky this will make any boring day much less so. Enjoy! Deena, glad to see we’re on the same page. Vishnu, yes, go ahead and try it. I’m sure it will be wonderful! Let me know how it goes. Thanks RMW – it does taste & look like spring in a bowl. Raw onion and lemon were meant to be together. This looks like a perfect option for the brown bag lunch. I made this last night, and it was awesome. Thanks for a quick and easy meal that was way more exciting than the local pizza parlor (which is an awesome place too, but I’m tired of it when I’m tired!). This dish is a keeper! Growing up, my mom used to make a fried sole and she always served it with buttered orzo on the side. It remains one of my favorite pasta shapes – love it! I have been incorporating more nuts in my savory dishes recently and I am totally sold on how they can make a dish. Yum! 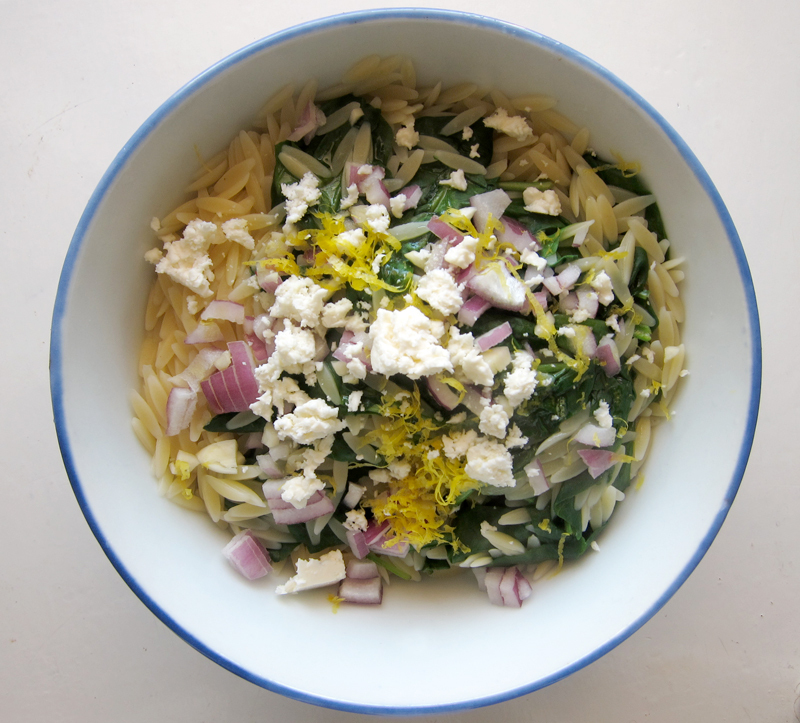 Love, Love, Love dishes with lemon and feta…it is just so “spring” to me. Thanks for adding anothe one to my repetoire! Can’t wait to try this one out. What a pretty dish! It looks so light and fresh. I’m a sucker for that bright punch of lemon zest. Elizabeth, I think so too! Diane, so glad you enjoyed this. It’s a perfect last-minute meal. Hag, I’m sure you’ll love this dish. It’s a good one. Thanks so much Nicole, it’s spring-fresh and so pretty! This looks delish! Perfect for an early spring dinner, and I suspect it would go great alongside grilled branzino (which, incidentally, I happen to have in my fridge for tonight!). I have some picked red onions that I might sub in for the raw ones too. cory, I had to look up branzio! Sounds delcious.